I was a little disappointed with this movie. I expected much more. Cinematically it was brilliant and it was an event/action driven movie when left me feeling a little disconnected. We don't know anything about these characters that we see and I personally didn't feel any emotions for the movie, even though I wanted to. I found myself quite bored halfway through the movie, the whole time I kept expecting more. Tense film draws you to a doomed group. 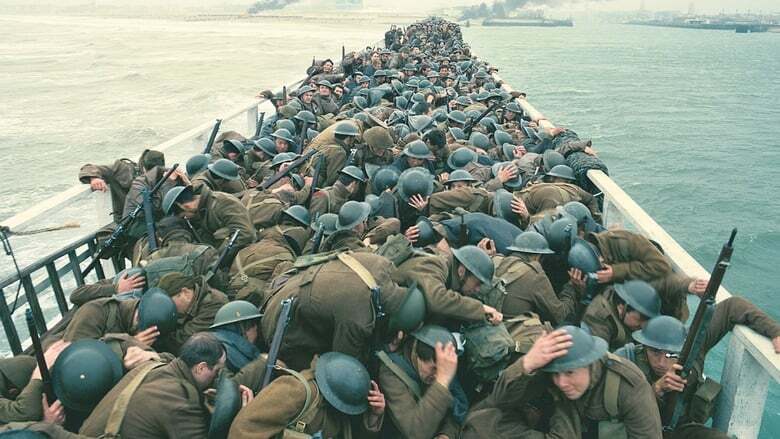 Those how are veteran war historians will quibble at some parts of Dunkirk, notably the separation of English and French troops in evacuation and the ships used to evacuate them. Dunkirk uses a few conceits to keep you involved. The first, which adds a notable amount of tension to the film, is a ticking clock in the background moving you to the final day. We see intercut scenes from different periods, prior, during and enacting the rout. Acting is excellent throughout, and versimilitude is achieved with models of aircraft, uniforms, landing stages and so on. Injections of friendship and subsequent loss direct our affection to the sufferers. Harry Styles is more than competent as a young troop and Kenneth Branagh brings integrity and verve to his role as a tired and firm leader. If one oversight might have been addressed, it is the lack of focus on the German side of things in this affair. Our few glimpses are of German fighters and so on, with very explanation of the goings-on at the front. Overall an excellent war movie meant to be among your top ten, if not top five (It will be hard to dislodge All Quiet on the Western Front, Apocalypse Now, Paths of Glory, Saving Private Ryan and Tora Tora Tora!, among others). Recommend highly a good 8/10. Dunkirk is a beautiful and unconventional World War 2 epic that is undoubtedly captivating, but it takes risks that may alienate some viewers. When people talk about a film they think it's about the setting, but it's actually about the characters. Saving Private Ryan isn't about World War 2. It tells a story about a squad of soldiers tasked with finding a young Private Ryan and getting him back safely to his family. Saying Dunkirk is a film about the Battle of Dunkirk however, is not inaccurate. The setting and characters are one. The choppy waters of the English Channel are equally as important, if not more so than the people who fought and died in them. As much as this makes for an interesting way to make a mainstream war film, it's also the reason why I wouldn't care to sit through it again. In some ways, it feels like watching a documentary with the narration turned off. I walked away impressed, and at the same time emotionally and intellectually unfulfilled. I have put off viewing this film for quite a while. The main reason for this is that I am somewhat reluctant watching a movie where the story is pretty well known before you sit down to watch it. However a few days ago I finally did and, given all the hype, I have to say that I expected more, a lot more. Sure the movie is a cinematically very well down movie. Acting, camera and all that is excellent. Unfortunately that is all there is. First of all, where the hell did the over-inflated budget go? Dunkirk was a major undertaking with almost 400 000 soldiers involved and hundreds and hundreds of boats. We get to see what? A few columns of soldiers, a handful of boats and three pitiful spitfires against a bomber and two Fock Wulfes. To add to this insult we pretty much get to see the same bloody event over and over from different angles. This is an insult to all the brave men that made this rescue possible. There are a few likable people in the movie. Like the Navy commander and the elderly guy on the pleasure boat steaming to rescue. The rest are either psychotic or morons. Realism? Not so much. Like the scene where a bunch of soldiers are trapped in a boat being shot to pieces. Would any one in their right mind really have thought they could plug dozens and dozens of holes with their hands and then sail across the channel? Then we have the spitfire which runs out of fuel and glides around forever over the beach so the director can get some scenic shots done. Other times fairly large boats gets damaged and flips over in seconds. I would also have expected some pre-story. Some build up. But no, the story starts right away with these measly handful of boats and planes taking for bloody ever to drag themselves over to where they are supposed to go. Quite a disappointment indeed.